Listen to the broadcast version of Morning Edition Host Rick Ganley's interview with entrepreneur Andrew Yang. You proposed some fundamental changes to the political system and the democratic process like lowering the voting age to 16 [and] introducing ranked choice voting on a national level. Do you see New Hampshire voters as receptive to these fundamental changes? Have they been telling you that this is what they want? Ranked choice voting, there's a lot of enthusiasm for it here in New Hampshire. And I would say that and Democracy Dollars, which is putting $100 in the hands of every American voter so that they can recapture our political leadership and our democracy from the corporate interests. Those are the most important proposals. Lowering the voting age I do think is the right move, but that's something that I have not spoken to New Hampshire voters as much about and it's not as central to my platform. There is a lot of talk with Democratic candidates in this race about some real big fundamental changes. Do you feel that that is something that would receive bipartisan support? Certainly there's an appetite for change in the sense that no one's looking up and saying that they're thrilled about the way things are going in our government. And I believe that led to Donald Trump's victory in 2016 and that those difficulties have been ongoing. So we need to start fixing some of the structural problems that are making it hard for Americans to believe that our government can solve the problems of the 21st century. One of your central promises so far has been for universal basic income, which you're calling a Freedom Dividend. You've even set up an example of how that could work by giving a family here in New Hampshire, in Goffstown specifically, $1,000 a month. Why put this at the center of your candidacy? Well I'm motivated by again solving the problems that got Donald Trump elected. And if you look here in New Hampshire, you see many Main Streets are closing down. Many people are unsure how they can find a path forward when their houses are underwater and their schools are shrinking. And so if you're trying to solve those problems, you need to make an economy that works for people again -- a trickle up economy. And that starts with a universal basic income, and I was very happy to illustrate that $1,000 a month improves people's lives with the Fassi family in Goffstown. How does that work on a national level? Where does that funded from? Well the great thing is our economy is up to a record $20 trillion, up $5 trillion in the last 12 years. We can easily afford a $1,000 dividend for every American adult, and this would put more economic freedom and autonomy into the hands of Americans around the country. What we are doing right now for the Fassi family we can do for every family in New Hampshire. But getting back to the nuts and bolts of this, you see we can easily afford it. Of course this is a time of record deficits. How does it pay for itself in the long run? Well so here's the wonderful thing. If you imagine a New Hampshire where everyone has $1,000 a month, a lot of that money is gonna get spent right here in New Hampshire. It's going to grow Main Street businesses. It's going to grow the regional economy. It's going to create over 2 million jobs around the country, including more than 15,000 right here in New Hampshire. And a lot of that money just comes right back to the American people in the form of tax receipts. It would generate over $400 billion in new revenue. It would make our families stronger, and healthier, and better educated and mentally healthier, all of which would grow the economy. And it would over time reduce direct spending on things like incarceration, and homelessness services and emergency room health care. So this truly is a trickle up economy from people, families and communities up. We would get a lot of the money back. We have to do what good organizations and good companies do, which is invest in our people and then we will all be in position to win. New Hampshire has been hit hard by the opioid epidemic. I'm sure you're aware of that. You've proposed decriminalizing possession and use of small amounts of opioids. Why do you think decriminalization is a central part of combating the crisis? How would that help? Well right now we have to focus on getting treatment and resources to people who are struggling with addiction. And people who are struggling with addiction are often concerned about getting a criminal record or facing some sort of legal penalties for possessing and using illegal substances. Now let me say this is a federal responsibility, in part, because the feds let this happen when Purdue Pharma started dispensing hundreds of thousands of prescriptions around the country. And so it's a responsibility for us to put resources into the hands of New Hampshire communities so that we can start to try and reverse this plague. And that starts with knowing that it's not a jail cell that should be awaiting people who need treatment. It should be treatment resources. So your idea is really, obviously, don't punish the users, but look at the larger traffickers? Yes. So so obviously if you're running a criminal enterprise and profiting on the deaths and overdoses of others, then you need to go to jail. But that's not the average user. And so it's very, very easy for law enforcement authorities to distinguish between someone who has drugs for personal use and someone who's running a drug dealing enterprise. New Hampshire has a low unemployment rate and employers are having a hard time retaining and recruiting workers here. You've been an entrepreneur. You've obviously had solutions in hiring. What kind of solutions do you have for economic development in rural communities specifically? Well the biggest challenge for rural communities is retaining people, retaining young people and creating a path forward. And so putting $1,000 a month in the hands of people in northern New Hampshire and rural communities would be a game changer for individuals and families, but would also create a path forward for local businesses in those communities and would help everyone make better adjustments. When I speak to rural communities, they say that this $1,000 a month dividend is the most powerful thing they've heard that might actually help turn things around for many of them. Listen to the unedited version of Morning Edition Host Rick Ganley's interview with entrepreneur Andrew Yang. 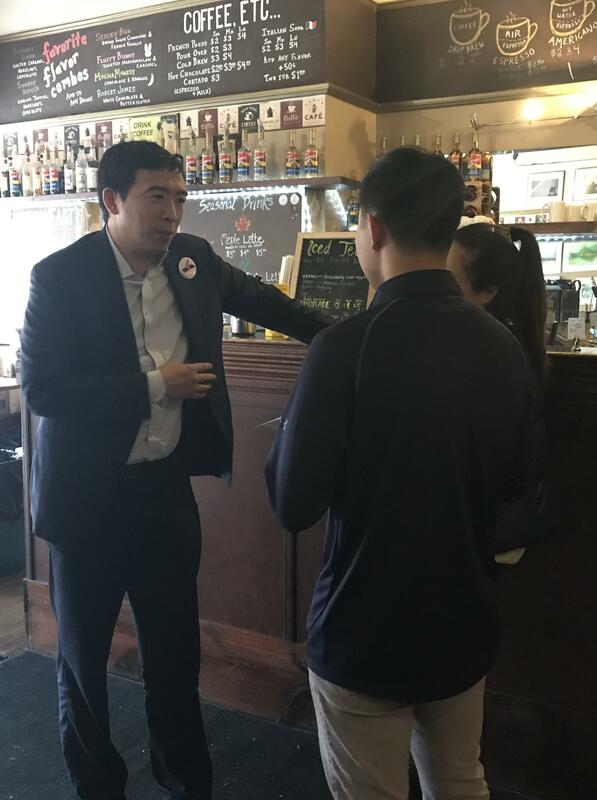 Longshot 2020 presidential hopeful Andrew Yang thinks all Americans 18 and over need a raise, so much so that he’s basing his entire campaign on Universal Basic Income, or the idea that the government should provide a set amount of money to help cover the basics. This year, Yang is testing his so-called Freedom Dividend with the Fassi family in Goffstown, New Hampshire, who will receive $1,000 a month for a year.